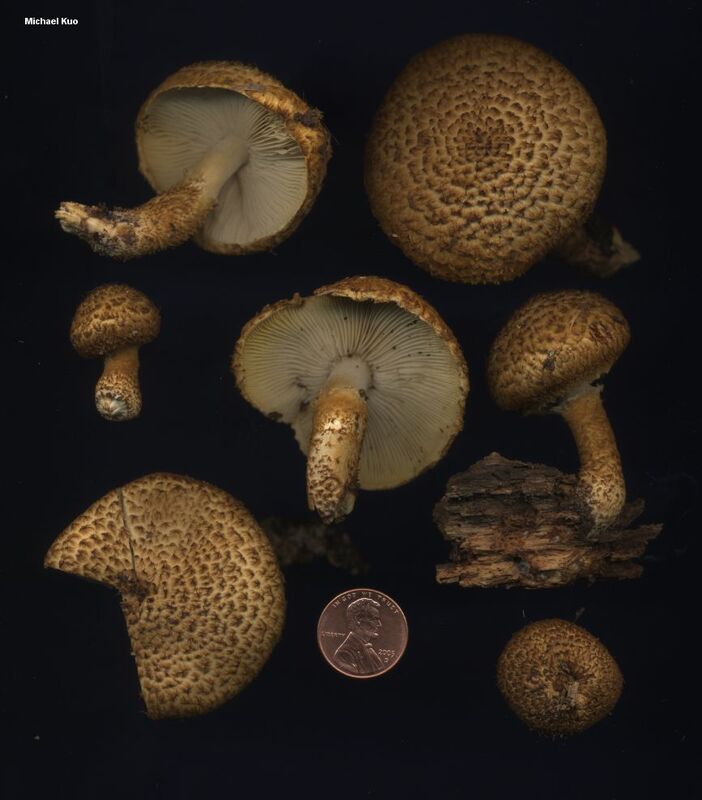 Beautiful and distinctive, Leucopholiota decorosa looks a lot like a species of Pholiota--but it features a white, rather than brown, spore print, and differs microscopically. It appears to be most frequently found from Ohio to New York, but its range includes much of northeastern North America. 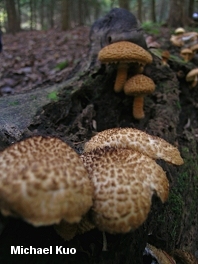 Armillaria decorosa is a former name. Leucopholiota lignicola (Karsten) Harmaja is the only other recorded species in the genus Leucopholiota; it is associated with birch in boreal Eurasia, and features nearly free gills; it is otherwise very similar. 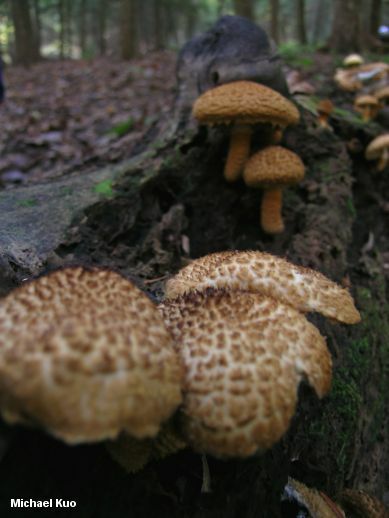 Ecology: Saprobic on the deadwood of hardwoods, often in forests of beech, hemlock, and sugar maple; growing alone, gregariously, or in clusters; late summer and fall; fairly widely distributed in eastern North America. Cap: 2.5-7 cm; round at first, becoming convex, broadly convex, or nearly flat; dry; covered with conspicuous, brown to rusty brown, pointed scales; the margin inrolled and hairy. 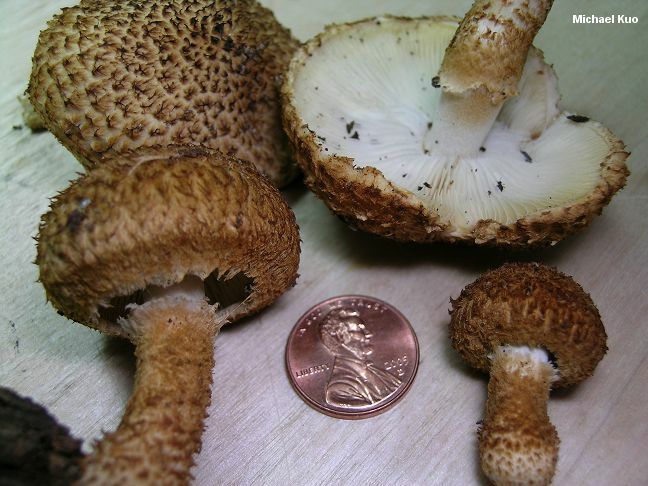 Gills: Attached to the stem by a notch; close; white; at first covered by a partial veil of rusty brown fibers. Stem: 2.5-8 cm long; up to 1.5 cm thick; dry; bald and white at the apex; sheathed below with rusty brown scales and hairs; with a folded-over ring zone at the top of the sheath. Odor and Taste: Odor not distinctive; taste not distinctive, or bitter. Chemical Reactions: KOH negative to slowly pinkish on cap. 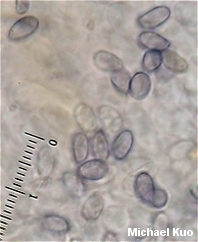 Microscopic Features: Spores 5.5-6 x 3.5-4 µ; smooth; ellipsoid; amyloid. Cheilocystidia clavate to rostrate or fusiform. Pleurocystidia absent. Pileipellis a trichoderm. Clamp connections present. REFERENCES: (Peck, 1873) O. K. Miller, Volk & Bessette, 1996. (Smith & Walters, 1947; Bessette, Miller, Bessette & Miller, 1995; Miller, Volk & Bessette, 1996; Roody, 2003; Vellinga, 2004; Miller & Miller, 2006; Harmaja, 2010.) Herb. Kuo 10101003.